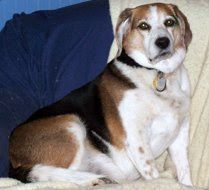 My Breed: I am Beagle boy. My Color(s): I am tri color - black, brown and white. My Favorite Thing To Do: I may be a little portly, but I still love to go for walks! My Pet Peeve: I don't like getting hugged too tight. My Favorite Food: Anything my mom and dad will give me. Yum, yum! My Funny or Unusual Habit or Routine: I like to paw at people to get their attention. I just love attention. My Best Quality: I'm just a real good boy. What Makes Me So Special: I had to be left at the Massachusetts Society for the Prevention of Cruelty to Animals when a family member got sick. My new mom and dad had just lost their blue tick coonhound, Aubrey Jean, and saw me there a few days later. They took me home, and I've been their best pal ever since. I appreciate everything they do for me and love to always be with them. I have visited four states and have been to Cape Cod numerous times.